FX Important Consideration or Background Noise? 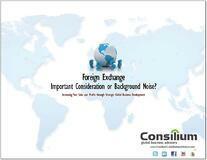 FREE eBook: FX IMPORTANT FACTOR OR BACKGROUND NOISE? There's a big business world out there. Sometimes it feels daunting. Many exporters obsess over transactional details, including foreign payments, and most structure their transactions in USD exclusively. And that's OK, but your company is different. Foreign currencies can be easily handled and turned into a competitive advantage. Managing that risk - or even making a few extra margin points on your deals! International business feels complicated, but it doesn't need to be. Even the seemingly complex finance and logistics aspects can be managed and leveraged to advantage by new exporters. Get a whole new perspective on this important part of international business and learn how you can become more competitive!